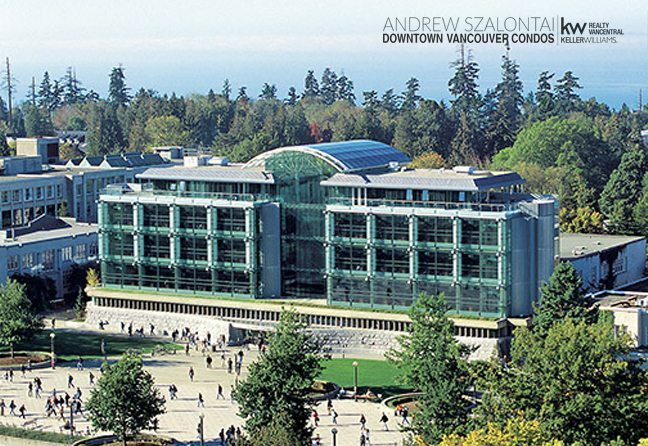 UBC is not only one of the top universities in Canada; it is also home to a thriving residential community, as well as many sites and activities. UBC is not only one of the top universities in Canada; it is also home to a thriving residential community, as well as many sites and activities. If you are looking to purchase property within the UBC district, it is a great investment for immediate gratification, as well as payoff down the road! UBC is laced with great trails and parks to explore. In fact, it is completely surrounded by the Pacific Spirit Regional Park – an ecological “sacred site” with trees that are hundreds (if not thousands) of years old, with plants, animals and foliage scents for miles. Runners and walkers alike grace the Oceanside cliff-edge daily, and locals regularly take in UBC’s amazing West Coast experience at their doorstep. UBC Botanical Garden & Centre for Plant Research is also a great way to get out and uncover your local forest, with all its ancient flora and fauna for all enjoy. And, it’s all below the suspended Canopy Walkway – which is yet another enjoyable UBC experience! Alternately the Nitobe Memorial Garden offers a traditional Japanese wonderland filled with cherry blossoms, irises and maples – depending on the season they are in bloom …it is a spectacular sight. 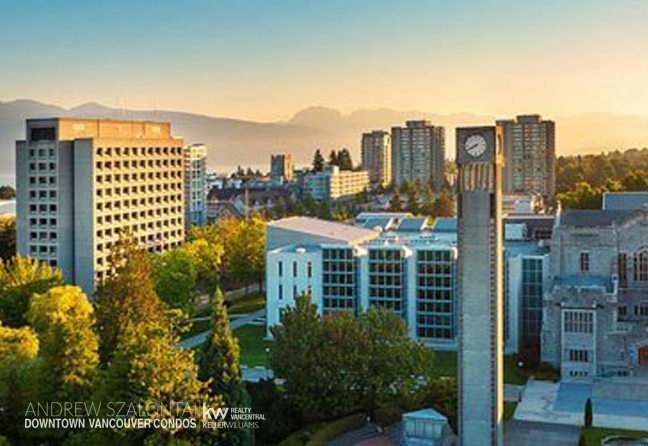 UBC, or the University of British Columbia, is not just a Vancouver community intended for university goers; it is a thriving Metro Vancouver neighbourhood that is filled with beautiful condos, townhouses and homes, with shopping, dining and exploring opportunities around every corner. Surrounded by the Pacific Spirit Regional Park and all its lush glory, runners, walkers, bikers, hikers and beach goers come to UBC to enjoy the natural beauty and West Coast bliss, making UBC the ideal real estate investment choice for many. UBC was a vision of Superintendent of Education – John Jessop, who submitted a proposal for the creation of a provincial university many years ago, and as such, An Act Respecting the University of British Columbia was passed in 1890. After which time disagreements were had as to where to actually build UBC, with Vancouver Island or Vancouver itself being under consideration. But clearly we know which location won the battle, and the thriving community and university district of UBC continues to grow to this day. With a youthful glow and ample growth potential remaining, UBC is a thriving community surrounded by lush gardens, including: the Botanical Garden &amp; Centre for Plan Research, and the Nitobe Memorial Garden – a traditional Japanese garden highly popular with locals and far-flung Vancouver communities alike looking for cherry blossom photo ops in the spring.Thick in history and thriving today, UBC is already a success, and is an A+ region in which to purchase real estate – something I’d love to help educate you on, and show you around this fantastic Vancouver hub to the furthest west of our great city! Museum of Anthropology, Beaty Biodiversity Museum, and Pacific Museum of the Earth are 3 of the best museums you are likely to find in Vancouver – and they are all within the UBC Community and well worth a visit! UBC’s very own team – the Thunderbirds, are ranked #1 among many varsity college sports within Canada. So whether you are cheering on your local University team, or catching a live outdoor concert that are also often hosted here …it’s a great venue fueled by a great time! Although UBC can be found at the furthest reaches of our Western Canadian tip, through Kitsilano and outside of Kerrisdale, it is not without amenities or conveniences – both of which are plentiful. In addition, it is one of the most beautiful and nature-filled locations in which to live in Vancouver, and it is waiting for you to call it home. Take a drive through, or give me a call and I can show you around and help you discover why this area is for more than an attraction for University students and tourists! So whether you call Vancouver home and are looking for a local community fix, or are contemplating buying in Vancouver and wish to wander the districts that make up our fabulous city …ensure UBC is one of your stops along the way. It’s a genuine gem, and well worth the stop!